Hello Micheal, here are some shots of the event at St. Jean-Port Joli. What a great time we had there too. Vahe Tokmajyan was the team captian and Mark Stuthiet and I filled in the rest of the team. The event was four days I think so the trip was about 6. 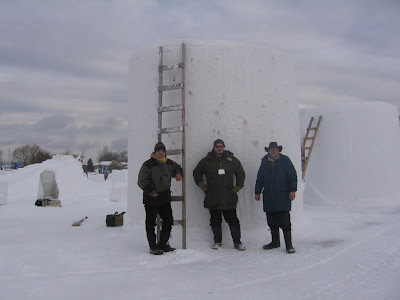 Our blocks were 4 meters high and 3 in diameter I think. We did a piece titled "The Three Graces". All of the sculptures were beautiful and the last night was really "cool". The carving stopped at 12 noon on Sunday and 5pm the others, except Saturday. Teams were allowed to start at 8am on Saturday and work right through the night until noon Sunday, and most did. That was a blast....and beautiful with the spotlights shining on the sculptures and the public all around the sight. Start at the bottom for a kind of chronological progression. This is the Cubans sculpture, it was great! A group of people dancing in a circle. It really conveyed the feeling of the whole event for me. Just after noon on Sunday and the quitting bell rang we took pictures. Some of the details are going on and the negatives spaces between the masks and figures is starting to go in. The site was crowded with artists and visitors throughout the whole event. 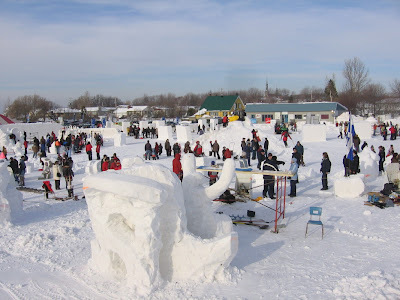 St. Jean-Port Joli is a town of 2500 and the attendance was over 15,000!!! 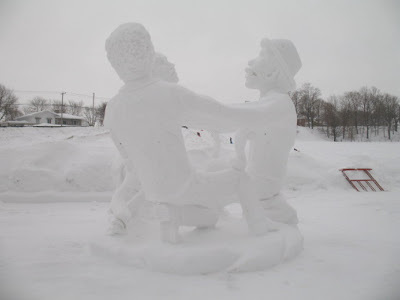 Wow, art can create great things, even for small towns. This is out of sequence too, likely the morning of day 3. This is the end of three days, the next day is 28hrs long, we should be able to finish it just the way we planned in that time. Each night there was a get together in the artists lounge with a band etc. First we showered and ate at a restaurant. Many made special meals for us, in fact some of them were closed for the season but opened during Fete Dvir. Hospitality was great, the food and the social events. We visited a sugar maple farm and toured the town which is full of art. They have five international events throughout each year here. Back to the begining but this is a shot of our block and some of the others near it. 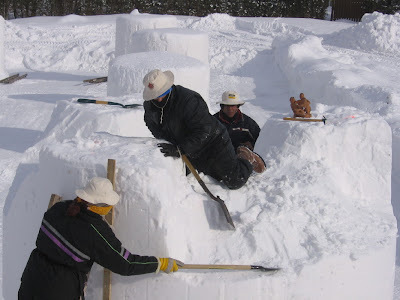 The Cubans kept at it too, we had breaks for snowball fights etc but it was mostly work as there is only a short time to complete the sculptures. This is likely late on day two, two days left and some of the tricky stuff left to do but the form is there. By the morning of day two we were moving into the block, maybe this was later on day 1. Not sure. 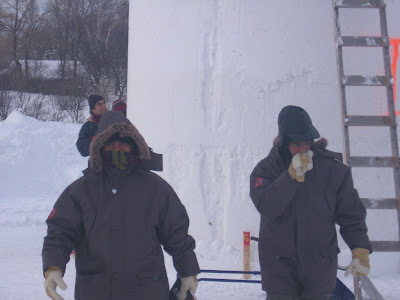 The first day was particularly cold, I felt sorry for the Cubans that were our neighbors. They hung in there and worked through every day. After we marked the block out it was time to do some power digging to be able to work on the masks and figures. This is our block, they were drawn by lots, some had different qualities than others.....well that's just the way they did it. This summer's art experience has been a long saga. Starting at the end of February I began working at my property to prepare for the symposim here. 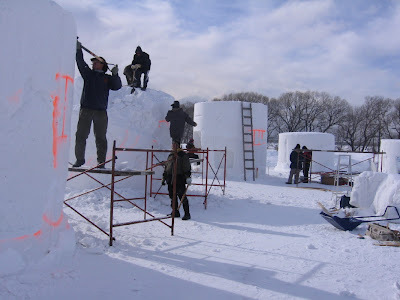 A lot of work on the site and equipment along with administrative work to make it possible for the sculptors to visit kept me going from 6am till midnight a lot of days. Family, friends, communities, organizations throughout Alberta were so helpful. Thier help to cover all the big tasks and little details was essential to see the event go ahead and ultimatly be such a success. AND, because of that success I am confident that it will happen again. 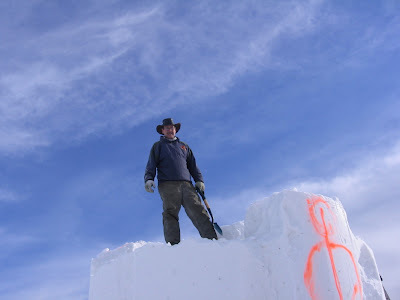 I am optimistic that we can do it again in 2009, although I know it will be a lot of work all over again, as the goal will be to do it up even better. Immediatly after the symposium in Bergen my trip to China, Russia, Thailand and Viet Nam began. Again, it wouldn't have been possible without the assistance of such wonderful people from home and abroad. I have had a tremendous experience, many new opportunities have presented themselves and some new projects have been fostered. 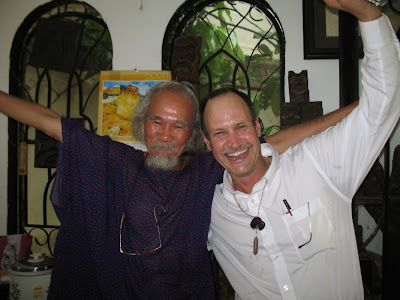 Most notably is the international project that was born early during my time in Viet Nam, my old friend and incredible artist Pham Van Hang can take credit for envisioning that. Although I can't divulge details now I will say that when it becomes a reality it will be the start of a project that will provide many cultures with a greater understanding of the arts and how they communicate the ties between all peoples on earth. Art has an ability to convey that sentiment, work that has been created thousands of years ago and now has the chance to be seen and understood throughout the world is doing that and this new project is an opportunity to further it. For all of the assistance and support throughout this year I thank the following people, members of groups, communities and organizations. If it hadn't been for all of you this year's project and ones that will follow would only be dreams of possibilities lost. Sculptors Association of Alberta, Sundre Motors Ltd, Sundre Museum, Didsbury Liquor and Beer, Olds Coop, City of Calgary, Calgary Tourism, Prairies to Peaks, Travel Alberta, AG Foods Didsbury, Tim Hortons, Wild Rose Real Estate, Didsbury Museum, Town of Didsbury, Richard Marz (MLA Olds, Didsbury, Three Hills) Mountain View County, Town of Sundre, Town of Olds, Town of Carstairs, Rockyview Ind. (Calgary) VOLUNTEERS: Lori Syer, Nick Vanderzwan, Tracie Ward, Shirley Paradis, Brian Vanderzwan, Jim McAllister, Brontie Tkachuk, Christine Sarsons, Glenn Kowalsky, Frank Scholzen, Danny Joe Jones, Richie Valthius, Eileen Heidler, Christopher White, Christine Pinder, Brad Callihoo, Steven Pope, Kailyn Ritchie, Samia and Nigel, Mark Stuthiet, Jessica Thompsom, Al Henderson, Pat Galbraith, Deborah Wilson, Ed Stacey, Wendy Tredger, Ed Morgan, Dana Geaudrue, Barry Hainsworth, Melody Enman, Tran Viet Hung, Tran Thahn Nam, Pham Van Hang, Nguyen Tan Cuong, Bui Hai Son, Jock Hildebrand,Luong Van Thanh,Marjorie Davies, Ngo Liem,Van Ngoc, Chien, Pham Minh Chien,Peerapong Doungkaew, Pham Van Hang, Quang, Vu, Stepen Turner, Tran Truc Phuong, Tran Viet Hung, Vahe Tokmajyan, Valentina Dusavilskaya, Yury Tachenko, Russia Ministry of Culture, Constantine (major sponsor), Peerapong Doungkaew, Paul Haggins, Vahe Tokmajyan, organizers of the Global Sculpture Conference in Chang Chun, China AND many others that I fail to recall at this time. I know the real list is twice this size. The commraderie that the artists, administrators and volunteers in Russia, China, Thailand and Viet Nam developed during my stays there were/are an invaluable bond that will help me to continue my path in art successfully. It makes the realization of our dreams possible, I look forward to future experiences in art at home and abroad. I hope that my work in organizing and participating in public art programs will contribute to appreciation for art and the benefits it provides as well as realizations about the brotherhood that all people share. With increasing technology the world has and will continue to be a smaller place. Our actions and sentiments have the opportunity to touch others around the world, let's strive to make those ones of love, respect and recognition that we all hold similar values. Thanks also to all those that have followed this blog, I have created it in the interest of developing an undedrstanding and appreciation for arts of all kinds. Music, dance, theatre, the visual arts, poetry...........all have an ability to stimulate friendship between those that share it as participants, organizers, and attendees. Finally; In 1992 I was invited to join the Atti2ude Club, since that time and through that organization I have gained an education and had opportunities presented that are far beyond my wildest dreams. For that I must say that I can't express my thanks, the openness with ideas, concepts, knowledge of art and thier overwhelming support has made all of this possible for me. Following is a description of qualities that members hold and cherish and a brief description of my development as an artist. 2 you know that everyone who does art gets something and contributes something from it. 3 you don’t think there are hard and fast rules about art. 4 you know that the first person to create a new art form probably had a lot of people that said it wasn’t art. 5 you think non-traditional mediums are great for making art. 6 you don’t know all the terms relating to art. 7 you know all the terms relating to art. 8 you know that you don’t have to have a studio to be an artist. 9 you know that you don’t need a parchment to be an artist. 10 you have a parchment. 11 you don’t have a parchment. 12 you have developed a technique that you share freely with others. 13 you have developed a technique that you would rather not share with others. 14 you respect that someone developed a technique but would rather not share it. 15 you understand that art can be a great benefit to your community. 16 you volunteer to arts events just to be around other artists and enjoy their work even if yours may not be included. 17 you aren’t an artist but you volunteer to arts events just to be around artists and enjoy their work. 18 you don’t care for certain kinds of art but don’t say so. 19 you can sit around a camp fire or kitchen table and talk about art all night. 20 you’re game to try something/everything even though you know you might not be very good at it. 21 you only do one kind of art but you do it with passion. 22 you want to help spread the word and demonstrate that art can be a benefit to individuals, organizations and communities. 23 you pass opportunities on to others because you want to see them succeed with their art. 24 you know that creating art is very fulfilling and you’re happy for people who find that place. 25 you don’t care if everyone thinks your work is art. 26 you’re excited about collaborative art because you want to be involved in creating a piece that you don’t have all the skills to realize on your own. 27 you see some Gawd awful art but you honestly like it because you know what fulfillment it gave the artist. 28 you don’t run the other was when you first encounter the club. 29 you know the reason it’s been around for so long is that there’s only one rule for membership. If you have the right attitude, you ARE a member. It's finished,(almost), and as usual my time left here is quickly coming to an end. I fly out of Ho Chi Minh City tommorow at 6am so that means getting up at three and to the airport. What a trip I have had this fall and from plans being made already it looks like I can look forward to something similar next year. Sometimes I reflect on the work that goes into this stuff and wonder how I will do it but that feeling is fleeting as enthusiasm takes over and I can't wait to get to work and get as much done as I can. When I look back I realize that without the support network I am so lucky to have these things simply wouldn't be possible. Thanks go out to everyone at home and around the globe to people that have helped me achieve my dreams and will make it possible for me to persue new ones. 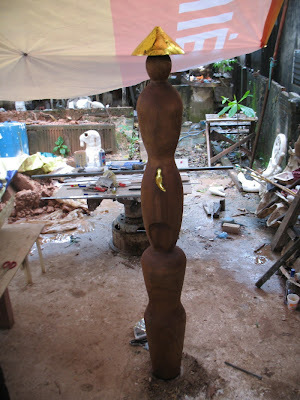 This is my sculpture, almost complete. I designed the base from granite and wood, it will be made for me during November before I get back for the opening of the exhibition. I applied gold foil to the top of the hat which represents sunshine and to the baby, the sunshine and future of family and mankind. Minh, Nam and Chien pose with me and "From the Heart" as I left it at the studio. 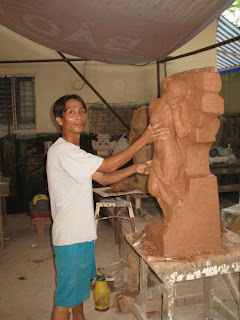 I will sign it after the base is finished, when the sculpture is truly completed. It rained all day so we had a chance to take off our shirts, you just can't chance that when the sun shines as I learned in 05 when my photographer was almost killed by the sunshine. Odd that in Canada we can take our clothes off on a nice sunny day and have to dress up when it's cold out, here it is the opposite, in the sunshine you cover up as much bare skin as possible and take it off on days that aren't so nice. The sculpture I brought along with me "Ice Wood and Fire" will also be exhibited. 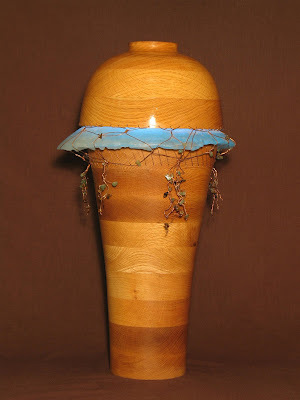 The main element is a wood turning and complimented with glass, metal, stone and light. This piece was a collaborative effort with two Atti2ude Club members and great friends Tracie Ward and Shirley Paradis. After the show in HCMC it will be shipped to Russia and become a part of the permanent collection of the Penza Museum of Fine Art. I think all of this is pretty (really) cool and hope that I will have other trips in the future that can compare, in even a small way, to this year's. Pictured here are Hung, Chien, Cuong, Minh and Nam. As usual the food was delicious and we had a great time talking about my time there, past experiences together and what is to come in the future. I hope to see these guys in Canada sometime soon and many other wonderful artists that I have met over the last several years. I think it is possible to include Canada in the global project we will launch over the next year, something that we have spent a lot of time discussing during my time here. That is one of the tasks I have to work on in the next few months. After our farewell lunch I went on a whirlwind shopping trip in downtown HCMC. 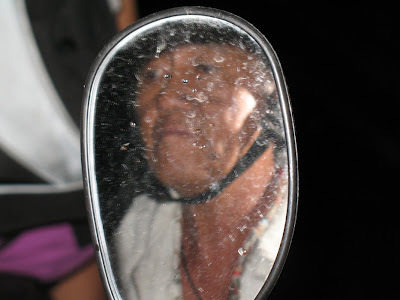 My cyclo driver, Sit, was a really nice guy and helped me with getting to the places I needed to go. 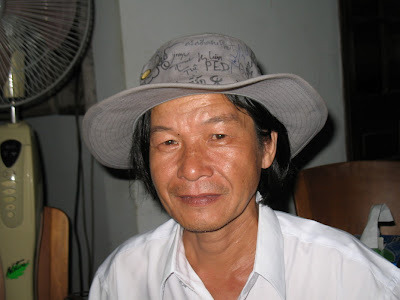 He also negotiated fair prices for me with with shop owners, knowing that I have come to Viet Nam several times and plan to return I feel like I don't get treated like the average tourist. Cuong took me back to my hotel, this is a view of him that was pretty much standard for me during this trip. It was a long ways from my hotel to the studio but rather than let me take a taxi he picked me up at the hotel to drive me to the studio and came back to take me back at the end of the day many many times. His wife To and daughter To Lan helped me with shopping etc and were just great friends. To cooked a traditional North American supper for me one day, spagetti with all the fixins including parmesan cheese. I really appreciate the help everyone gave me and down home hospitality. I felt right at home all of the time, not like I was on the other side of the world. Kicking myself that I didn't take any pictures of Hung's sculpture of Ho Chi Minh, I did take this short clip of the work on it. 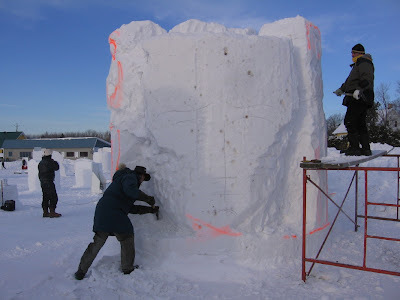 This portion of the sculpture is up to the knees, so you can get an idea of just how large it is. 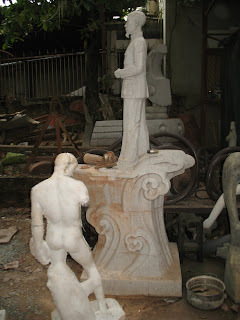 In the backgound you can see the model of the torso and the granite sculpture. There is another torso behind this worker that will be destroyed as the work began on it when Hung was in Bergen, when he returned he found that some proportions were out and the piece could not be saved. OOOOPS! I do have a still pic of the model in the studio where you can see the design of the whole sculpture I think it will be about 30 feet tall when it is installed. 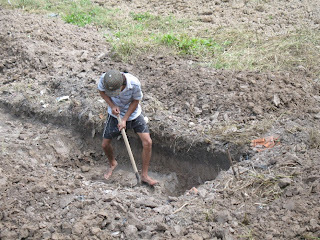 I will see Hung this morning, I hope he brings me some pictures, he just finished the instalation yesterday. I was surprised when I got to the work site that there were two busts in granite. Hung wasn't happy with the way the first one worked out so they started all over again on that. At the restaruant near the studio food is weighed live at your table before it is prepared for you. 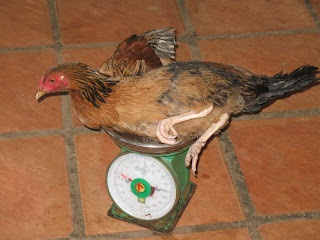 The picture of the chicken on a scale earlier in my blog is at the same place, this is normal and practical. Your food is fresh and doesn't require refrigeration at the restaurant. That cuts down on power use and spoilage, both of those are a big concern at home in food stores an restaurants at home. Maybe we could take a lesson from this practical way of doing things. 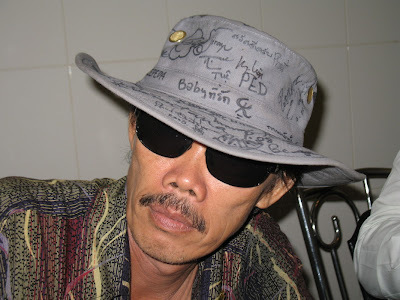 My friend Hang's son is a painter, sculptor and musician. The day I visited thier home he played one of the songs he wrote. I got a real kick out of the sheer enjoyment Hang had for his son's music, he is such an energetic man and delights in his own creations and those of others. I will miss all of these guys until I see them again. 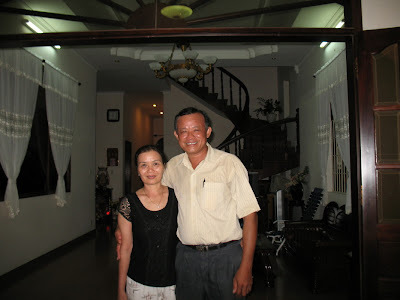 This is a short video taken in the home of Van Ngoc, Cuong took me to meet him the weekend we visited Vung Tao. To really do justice to the body of work that he has just in his home would require a full length documentary. I was enthralled, couldn't really visit because there was just too much to see there, even his dining room table is a work of art in it's mass and simplicity. I think it must weigh close to 600lbs in solid teak. Well everything in the house is a work of art even if it is something utilitarian. I expect the pots they cook in are hand made and decorated. I hope I will see Ngoc in November when I come back for the opening of the exhibit. One night on the way to Cuong's house the traffic was a little heavier than normal so I decided to take a short clip of that. The way that traffic moves here reminds me of a flock of bird or a school of fish. Since being here and traveling 100's of km on a motorbike I have only seen one accident so far. In Canada we could never move this volume of traffic. It may seem disorganized but there is a system and I think it works extremely well. If there is no lane in front of you you can move to the side. Although horns are honking all of the time they do not mean that someone is annoyed at another, just letting them know where each other are. You do get used to all of the honking and beeping, now I ride like everyone else, just enjoying everything that is going on and letting the driver do the driving. The studio when I first arrived, the main work that is going on is a series of fiberglass sculptures that will be used in colleges, universities and art schools for studying the heman figure. There is a bunch of other work at the same time in metal, stone, and clay as well as my piece from wood. I could spend a few years here, well a lifetime, and never be bored. As I mentioned earlier the work on the figures is pretty much complete and they have moved onto a project that involves embossing a large number of metal sheets. 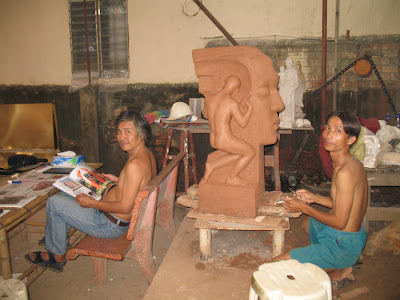 Shown here are three sculptors working on that project including my friend Minh. He just returned from a symposium in Korea and today is the first time I have had a chance to see him. 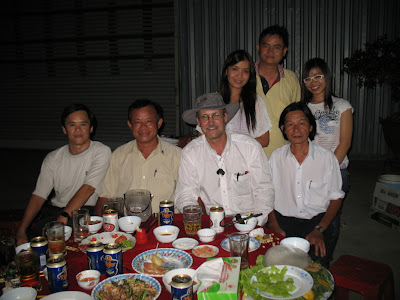 Seems crazy but I have a pile of good friends here in Viet Nam, well actually around the world when I think about it. It is neat that we run into each other in so many places. My friends Noell and Mervy will be here for the exhibition in November and then on to Hanoi for a symposium there. Paul Haggins and Peerapong will also participate in that one, wish I could be too but there is too much work to do at home now. I think that now that we have had one symposium in Bergen it is important not to let that idea die with the first event and some communities in Alberta are interested in creating one of thier own next year too. Here we go!!!!!! !......I hope. It is amazing to see how fast the work develops when experts are doing it. Minh has turned a sheet of metal into a work of art since this morning, I hope I will get a chance to see the finished work when it is installed. From the number of sheets that are here at the studio I think it is going to cover a very large space or maybe it will be several individual ones. I wonder what they will be working on when I get back the end of Nov. Well I must get going here, putting the gold leaf on my sculpture today and last minute details to Ice, Wood and Fire. Now my trip to Viet Nam is coming to an end quickly. I haven't become complacent about all the wonderful stuff to see but maybe less amazed. The last few days have been a little more relaxed and given me a chance to catch up on some admin stuff as well as doing some shopping. My friends here are taken care of me in gold medal fashion which is just wonderful. 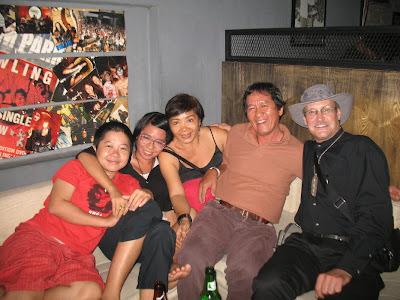 A couple of nights ago Cuong, his wife To Lan and another sculptor that I met at a theatre performance at her art cafe went out for dinner and then on to a night club, The Acoustic Cafe. That was a great time and at the end of the night they even encouraged me to get up on stage and sing a song. The music was mostly older rock and roll, they even played Rockin All Over the World, a song I think was recorded first by Status Quo back in the 60's. 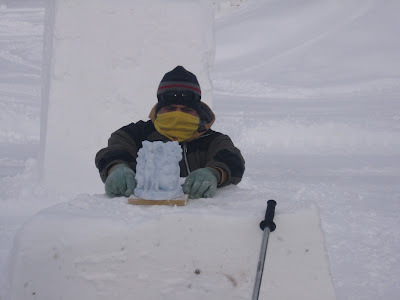 I spent an hour one day getting a light for my sculpture "Ice Wood and Fire" and then about 5 hours looking for oil to finish the sculpture I made here. I was really surprized that in about 100 paint stores etc no one had oil, Danish, tung, Swedish, Linseed or any other kind. I can go into the small hardware store in Sundre and choose from about 30-40 different kinds I would guess. Every place tried to convince me that laquer, shellac, epoxy, alkyd paint or something else. I guess they just don't use oil to finish wood here. Just when we were ready (Phuong helped me all day to try and find oil so it was not a communication thing that was the problem) to give up I saw another shop where I thought they might have it, as Phuong was explaining what I was looking for I was scanning the shelves and saw three lonely cans of tung oil at the back of a shelf. They were tinted which I didn't want but I took the lightest colored one as I thought I might never see another can of oil here. Today I returned to the studio, the tinted oil looks great on my sculpture, tommorrow I will do a few more little finishing touches and it will be complete and ready for exhibit. 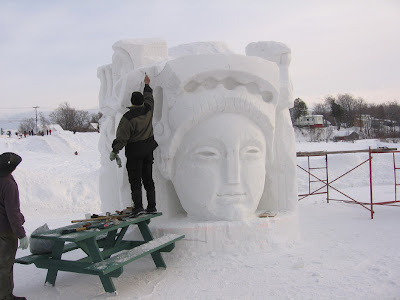 I will also do a few touch ups to Ice, Wood and Fire and my art work will be finished, I expect by noon or so I can come back and start packing and do a little shopping. I leave at 3pm or so on Saturday and after 18 hours traveling arrive in Calgary at the same time on the same day! I get that day twice. I have been keeping a list of names that I think are interesting on the motorbikes, I mentioned some in an earlier post. Here are a few more, there is so much going on when driving through the streets that it is impossible to take it all in. 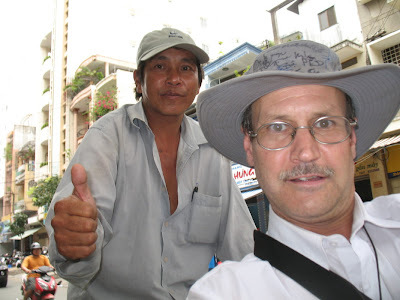 Here in Viet Nam there is a big movement to learn english and although the grammar is not correct in a lot of cases the spirit of the message is understandable and in some cases humorous. So, motor bike names include; Smart Mover, Urban Sporty Mover, Splendid Mover, Successful Mover, Revolutionary Commuter, Advanced ; Commuter.....one model I noticed has this slogan below the model name "The best function and good Sensation" Similar interesting interpretations of english are everywhere; on menus, hotel directories, store and shop names etc. Every Vietnamese person that bump into is eager and happy to practice thier english with me, conversations are difficult but fun. The other morning I needed some matches as I had used all of mine, I went down to the lobby to get some and the conversation went almost exactly like this. Receptionist: Don't you have any matches? Receptionist: What happened to your matches? Morton: I used them, they are burnt up. Receptionist: They are burnt!!!! How did that happen? Receptionist: You should not be smoking in bed. Morton: I wasn't smoking in bed, I was just lighting my cigar. Receptionist: We cannot give you another matches, we don't have one. Maybe we can get you one from another room later today. Morton: Maybe you could get me a lighter? .........At about this time I realized that matches and matress sound very similar. Through sign language and speaking slowly I explained that I wanted matches not a new mattress. She caught my drift and we had a big laugh. Here are a few more pictures from the last couple of days. I have been away from the studio for a couple of days, everything has changed there. Earlier this week they were casting a series of fiberglass sculptures that will be used in universities and art schools for study of the human figure, now they are working on reliefs made from sheet metals. Chien has moved on to another model for his exhibit in Nov. that will obviously be a complimentary piece to the one that he was working on last week. There is so much going on there that I could just sit and watch all day, so much to learn from these guys. We have a ball everyday. 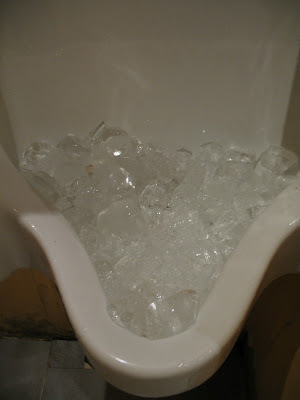 In the nicer night clubs the unrinals are filled with ice. I don't know the reason for that but it is interesting and kind of fun as you can watch the ice melt as you do "your business". 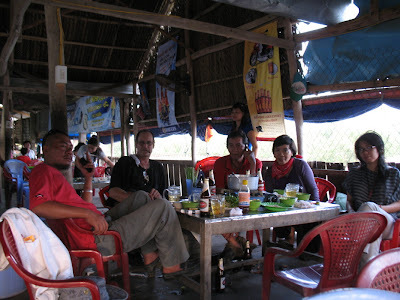 In the disco in Vung Tao it was big solid blocks. Hoang, To Lan, To, Cuong and I at the Acoustic Cafe. Had a really nice time there. I noticed a few times now that when the band stops everyone leaves,that's it for the night. Not like they leave in Canada, it happens instantly, like there is a stampede for the door. It is just the way it is here, five minutes after the band stops the place is literaly empty. I find myself watching the exodus and then sitting there with the staff looking at me wondering what the hell I'm doing, still there. Of course Hoang had her pic taken with my hat on. She is a lot of fun as most artists are, has her own art cafe in HCMC, I attended a theatre performance there last week by a Swedish, Danish and Norwegian group of artists. It was a thought invoking performance that spoke to the international ties we all now have, no choices about that in this day and age. At lunch time the other day my company was amazed that I ordered coffee, just not the right time of day for that and I guess just considered wierd in this culture. 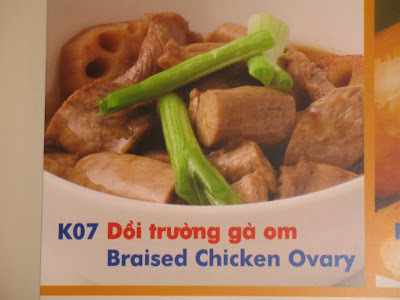 Well.......I got looking at the menu and figured it had some unusual items on it, so I had to take a picture. Items 1,3,4 and 5 might raise some eyelids at home but they are just ordinary fair here. 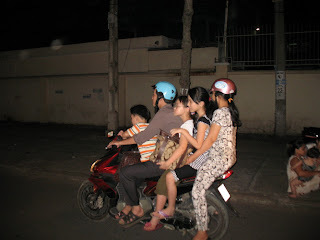 I haven't seen so much of this in the tourist areas of HCMC. Really glad that I am spending my time with local friends, I think I might be getting more of a taste of the real culture here than some other tourists. Some body always got in on the action, here Levon Tokmajyan from Armenia was really enjoying the performance and the singer got him up to participate. Matundo from Kenya pulled out his native folk music every once in a while and everyone loved it!! 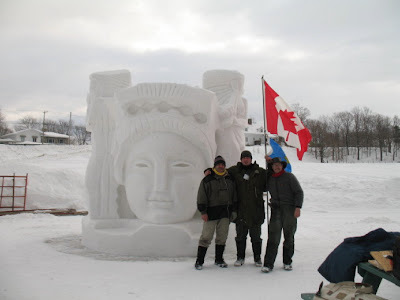 I think of him as a good friend now and hope that we can have in to Canada for his awesome sculpture and personality. I guess I should add a clip of me working, here I am taking material out for the negative space in the lower element of my sculpture. Big strokes with the striking tool and using a large chisel. Here I work on a detail. By cutting the edge of the opening at a 45 degree angle I create contrast which makes the form of the negative space very easy to see, creates a clean crisp outline. More ethinic music, these guys could really jam. This is the minister of culture speaking at the ceremony where we each recieved some beautiful gifts and a certificate recognizing our participation. After the ceremony we had our last supper together, 5 star! 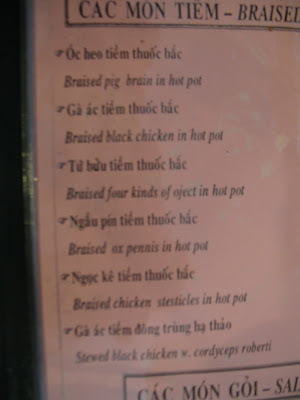 About 8 courses were capped off with roast suckling pig. Then the last night of fun began. 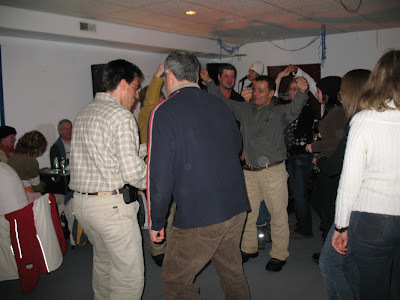 I think evryone danced.....and danced and took a thousand pictures, we leave for Moscow tommorow night. While we waited for the bus Matundo sang for us one last time. There was a lot of hugs and a few tears even though we will be on the bus for the next six hours. So that's it for Russia. When we got to Moscow I decided to go to Thailand for the opening of Peerapong's exhibit at the National Museum of Art and Culture in Bangkok. We got to Moscow about 7am and I was able to fly out at 8pm so I spent the day in the city with a few other sculptors who didn't fly out right away either. Now that I have figured out how to get on to my blog myself I can also put on some of the interesting videos. Christine Pinder from the Atti2ude Club has been posting my blog info until now as I could not get into the edit page in English. Thanks to Christine for that and to everyone that has followed my trip this fall. I hope that it has inspired more interest in art for some people that took the time to have a look. Just had to put this one on here as I think it sounds unbelievable, everywhere we went in Russia as a group we were escorted by police with lights flashing all the way. Our trips were in a beautiful bus with a tour guide telling us about points of interest and historical facts about the area. It is pretty typical that we get treated very nicely when we gather to create art in whatever culture we visit, this was a new level for me!! Thanks to the organizers for the wonderful cultural trips we went on and all the other special things they did for us. The comraderie that we developed will make any one of us glad to come back again I'm sure. 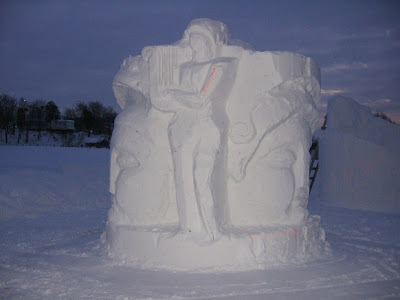 I just had to include two videos of this group of child performers, all of the sculptors were impressed to the max. Thier talent and the choreogaphy were mind blowing. The smiles on our faces spoke for our appreciation for the effort they put into showing us a good time, I'm so pleased to have had an opportunity to be here and to leave a piece of my work that I hope will be enjoyed by the people here. Another night young and specialy talented musicians entertained us, this girl about age 12 I think, was a mind blowing guitarist. Same night as the guitarist, these young accordian players were fantastic, two boys and a girl. This young singer on another night had a beautiful costume and an impressive band backing her up. This girl singing on the same night had everyone in the spirit with the lively songs she sang. 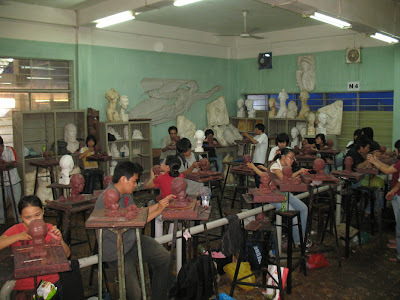 Sculpture sudents in class at the university. This is part of the parking lot at the university of architecture. Like the streets in HCMC, thousands of motorbikes. On the way to Vung Tao we stopped to see Hung at the work site where he is creating a huge sculpture of Ho Chi Minh, Uncle Ho. 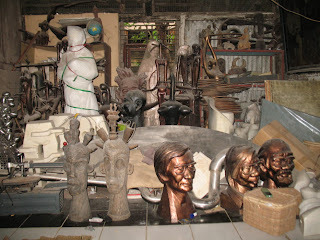 Another room in Ngocs home, art is piled high in every nook and cranny. Coung in one of the rooms in Van Ngoc's home at Vung Tan. As I mentioned before there is an incredible/eclectic collection of sculpture here. 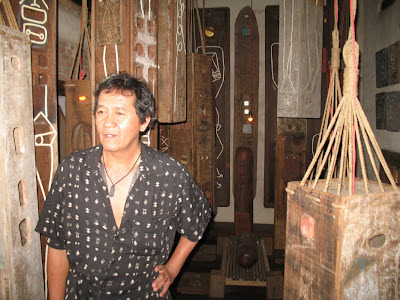 Need a couple of days just to explore and absorb his art. Just a glimpse of Van Ngocs home. 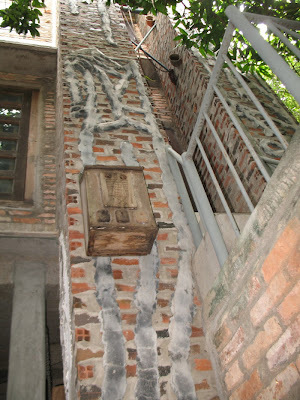 Like Hangs home, Ngoc designed the building himself and it is a work of art in itself. Hang and I, great to renew old friendships. I really hope that in time we can host these artists in Canada to create art works there. 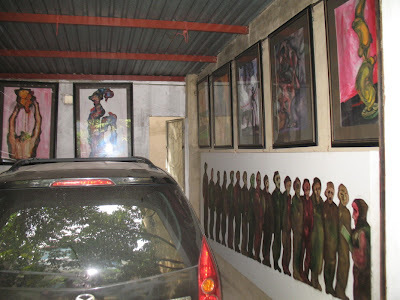 Even the garage is full of art, most of these paintings were created by Hang's son, also an artist. 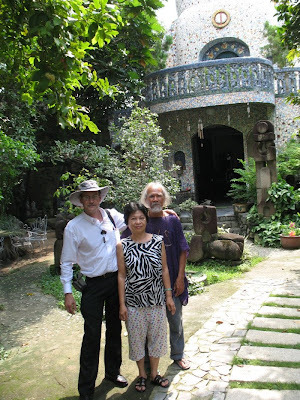 Pham Van Hang, his wife and I at thier home, a wonderful house that Hang designed himself. Like the homes of other artists here it is like a museum of art not to mention that the house itself is a work of art. A ritual is to sing some folk songs after eating. I do John Prine a lot or Old Mcdonald. Vietnamese music is beautiful and they all like to sing. Oanh, it is so nice to have old friends drop in unexpededly. We had a great time. After most people left we continues eating and vbisiting until about 10pm. 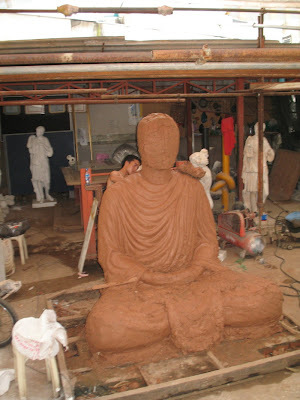 Here a clay model of a Buddha, it will be realized in granite and be shipped to Texas for a Vietnamese shrine or temple. The first course of the beautiful and delicious meal that Phoung cooked up last night. On the 16 I saw Thanh for the first time in 3 years, last time I saw him he had me over for a meal with his wife and two daughters. Since then they have had twin girls!!! 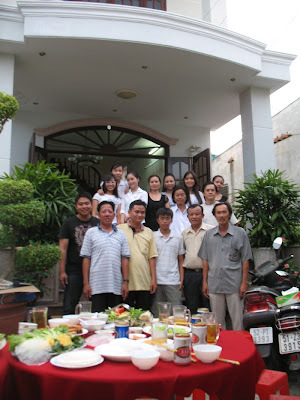 The group of us that got together at the home of Quang on Sunday for a beautiful meal and great visit. The granite model of Hung's sculpture of Uncle Ho, I visited the worksite where he is creating the sculpture the day I went to Vung Tao with Cuong and his family but didn't take pictures! 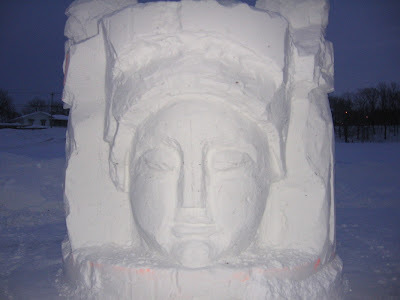 I think the figure is about 12 feet tall, the whole sculpture about 25 feet in granite. So many things to see on the street, it amazes me what they can transport on a motorbike. Here a family of five, not an uncommon sight. 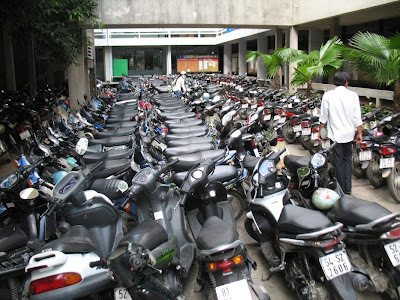 And these are 100cc bikes, at home we call them scooters. Next to the restaurant near the studio they are building a new hotel, here the footings are being dug in, check out the foot wear, I think I am the only one with steel toed boots. Working on details of my sculpture "From the Heart"
The studio has so much sculpture I can't imagine how to describe it, piled in every corner. This is just a smidgeon of the interesting things there. 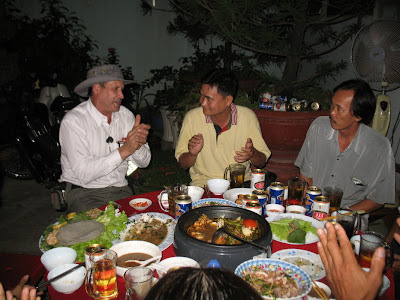 Vu, Cuong and I at Vu's home in Duong Binh province. 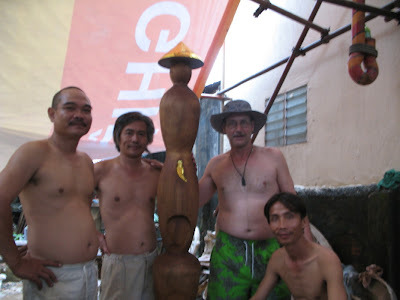 Vu is a professor of sculpture at HCMC University of architecture and specializes in wood, he is providing me with tools for my work. Everyone likes to try on my hat, I have it signed as I meet people. 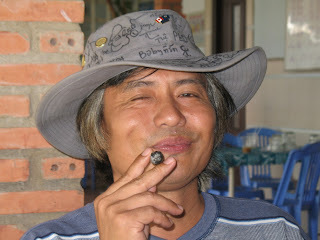 This is Nam, an old friend and Dean of Sculpture at the HCMC University of Architecture. 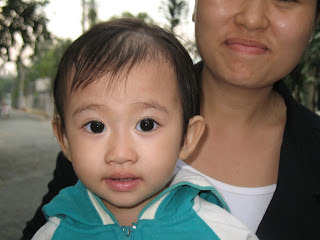 Vu's daughter, the children are so cute, Vietnamese people have black eyes. I could spend a lifetime just taking photographs here. 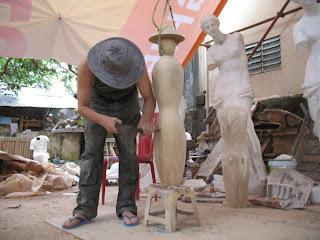 I am still in HCMC, after a day off yesterday I will go back to the studio at 9 this morning, today I will complete my sculpture for the show in Nov/Dec here. Then I have a few days off to be a tourist, do some shopping etc. 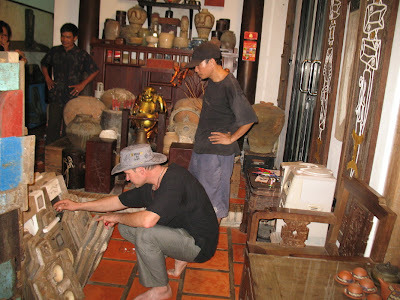 Not sure what I will do but would like to visit Chau Doc for a day or so, visit some friends there and see my sculptures too. I don't know if they have been moved or if the park was created around them where they were made. That is just a point of interest for me, will also be nice to see the works of the other artists that were in the symposium at Nui Sam (Sam Mountain) in 05, that will bring back memories of good folks and good times spent there. 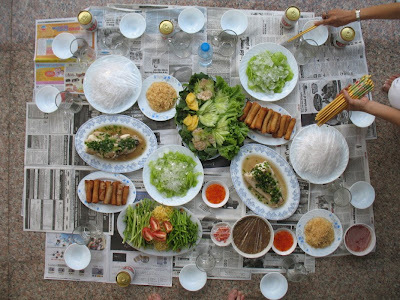 Yesterday Phuong hosted me at the home of his girlfriend's father, Quang, about 15 of us got together, had a beautiful meal that Phuong cooked himself. 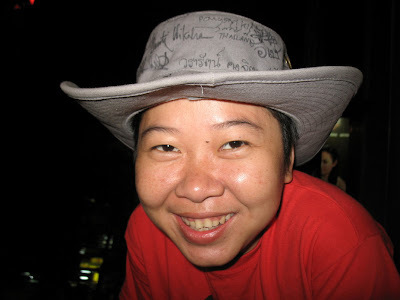 One of the sculptors that I know, Oanh, who I haven't seen yet on this trip came. 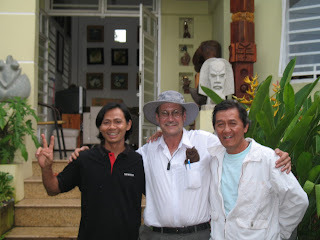 It is neat to see so many old friends, he speaks Vietnamese very well and I speak english very well so it was kind of neat to pass on that I remember him by describing his sculpture at Nui Sam through my broken Vietnamese and then he drew a picture of my sculpture there. We laugh a lot about things like that. I took lots of pictures, conversations are pretty hard to follow but luckily Phuong and some of the others speak english well. I had it kind of easy last night as four of the group were named Phuong so I could throw that out there and have a 25% chance of being right. There was a lot of discussion about the new project we hope to stimulate, when I get home there is a lot of work to do on that, we are optimistic that it will grow quickly and become a long term project. I think there is a good chance that it will launch in Thailand, Australia, Russia, Viet Nam, Japan, China and Germany as our group has members that are excited about this project and top level arts administrators in those countries. Big whuppin cudos to Pham Van Hang for coming up with this idea!!! 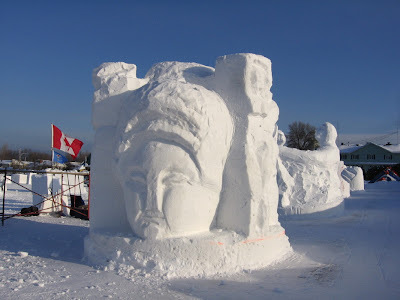 I am hopeful that we can create some interest in Canada too, I think (and everyone else that knows about it) that there is a real possiblity that this project will be successful and help to spread the benefits that art creates to communities, artists, business' and local cultures where ever it will be created.